A local community has come together to transform an overgrown area near their homes into a new ‘Trim-trail’ and wildlife area. Clwyd Alyn Housing Association officers Yvonne Cole and Alison Pring worked with local residents and members of the Abergele District Action Group (ADAG) to clear an area of overgrown land in Ffordd Melin Dulas, Llanddulas, ahead of installing a range of play and exercise equipment along with nesting boxes. “The whole project has been a brilliant example of people coming together and making a real difference in their local community,” said Louise Blackwell, Community Development Officer who worked with Community Development Assistant Julie Evans, on the initiative. “We were supported by a BIG Lottery Awards for All grant for the Trim Trail, and funding from Clwyd Alyn to help clear rubbish from the area. Travis Perkins Managed Services helped get the project off the ground in 2017 when they funded the experts needed for the initial clearance work and Peter Harris, Conwy Council Parks Manager) donated bark for the base area around the trim trail, which he delivered along with half a tonne of topsoil for the planter, which was kindly donated by Barneys Landscapes from Kimnel Bay. “It was brilliant to see everyone coming together for a work party event getting the site ready during August ahead of the grand official opening, by local Councillor Wendy Williams, last Friday. “The Mooncoin Ceilidh band provided entertainment for the opening with refreshments provided by the Abergele District Action Group, supported by Jan Williams, our local TESCO Community Champion. 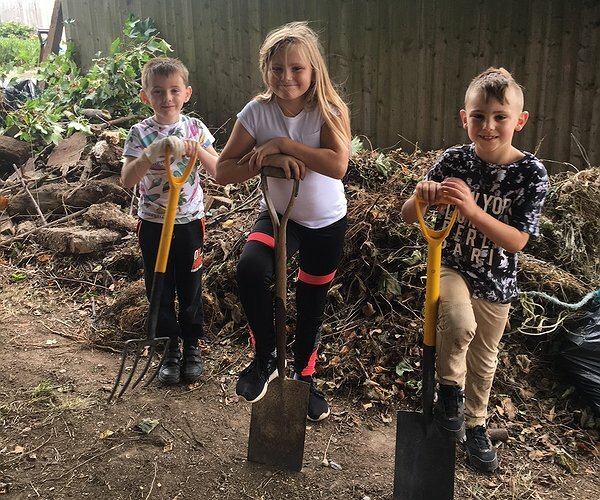 “Clwyd Alyn’s Asset Management Team arranged for remaining tree stumps on estate to be removed so the children can play safely in their new area, and also helped transport tables chairs and gazebos for our opening party,” said Louise who thanked all involved. "Fidget Fun for Care Home residents"
"Green fingers at housing scheme"